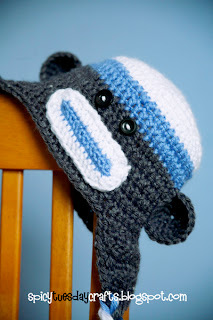 spicy tuesday crafts: I love Sock Monkeys! I freaking LOVE sock monkeys! I always have, although "always" for me didn't start when I was a kid, but after my son was born in 2007 which was when I first saw one. I guess I'm way late to the game. My mom showed me a package of the Rockford Red Heel Socks (which I later found out is the original socks the monkeys were made out of) and printed on the back of the package was instructions for sewing your own sock monkey! They actually printed it on the package! Brilliant! 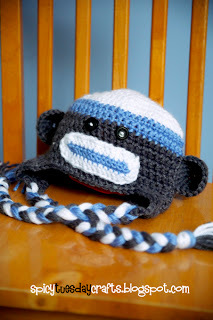 Anyway, I still haven't made an actual sock monkey toy yet, but my friend Valerie showed me a photo of a sock monkey hat and asked if I thought I could do it. Um, whether I can or not, it was way too cute to pass up! 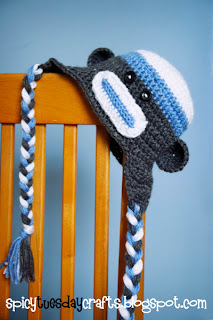 She wanted him in a gray/blue/white color scheme for her youngest son who's just 3 months old. I made it a little big, partly because I had to estimate his head size (I was so excited to get started that I didn't wait for her to send me his head measurements) and partly because it's the middle of summer here and the hat won't really be needed for a few more months. And I'm so excited -- she wanted him as an earflap hat! 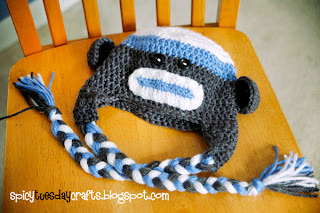 I LOVE earflap hats on little boys! Makes them look so cute! Okay, I'll be honest -- I love earflap hats on anyone. I wish I skied so I could wear them on the slopes. He's a keeper! I was so happy with how he turned out -- and I'm just a big enough dork -- that I'm making one for myself for our christmas tree cutting expedition this winter. We'll see if Kev will be seen in public with me and my new monkey hat. :) More of these will be in my etsy shop soon, in any color scheme you want; stay tuned! Do you have a pattern for your sock monkey hat? I love it! !